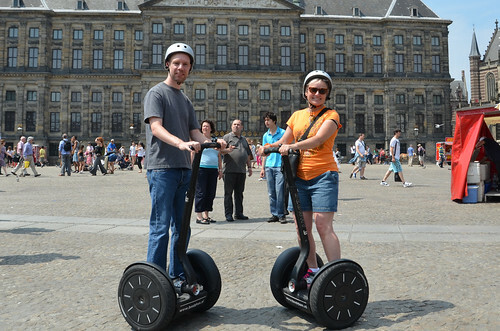 Yesterday we went on a Segway tour of Amsterdam with BestDam Segway Tours. It was my second time, DB’s first time. This second time for me was certainly much warmer! 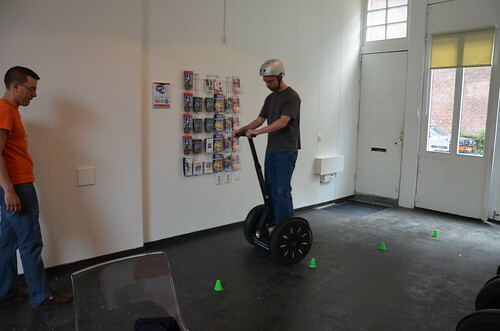 My first time on a Segway was in January and it was SO COLD! Yesterday was warm and sunny and perfect. The guys that run BestDam are great. 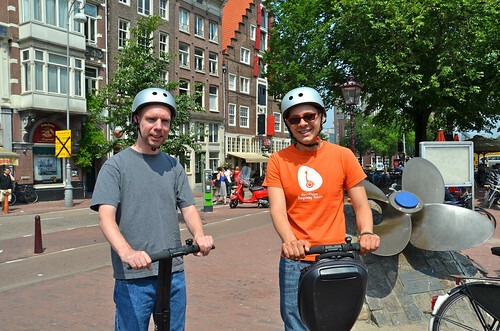 They make sure you are able and comfortable on your Segway before heading out onto the street. 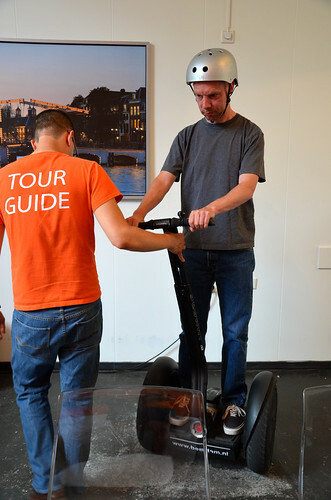 First you have to get set up on your Segway. Then you practice inside with little cones. You learn to stop and go and weave in between the cones. And then we’re out on the street, negotiating bike, pedestrian, car and tram traffic. We did the architecture tour, so every few minutes we’d stop and Daniel would tell us about the buildings we were looking at. Most of the tour took place in the Jordaan, but also around the Dam (top photo). I’m a little surprised that they take people into such crowded and busy areas. We are used to the amount and type of traffic on the streets of Amsterdam, but most people are not. I wonder how many people fall off or get into problems on a Segway in the city center. WE had a great time! I’d do it again. And again. Like. I’ll have to get Fred on one of those one of these days.